MV Nemo 1 is a brand-new boat, launched in October 2017. The boat offers our customers the best of everything. You can enjoy the comfort like a hotel in Khao Lak, short trips to the dive sites, enough space, delicious food, peace, security and comfort. The brand-new boat has a steel-hull, is 28m long and 6,5m wide. The technical equipment meets the highest safety standard. The maximum number of divers per day is 30 (including dive guides). There are a maximum of 20 guests per night, and all sleep in air-conditioned cabins. Compressors: 2 x Bauer Mariner 250-Electric with air cooling system and air filters. Facilities: 4 shared WCs of European model and standard with hot water showers. 2 showers on the dive platform. Cabin comfort: All cabins have air-conditioning and are equipped with reading lights, shelf unit, large panorama windows, electrical outlets, sheets and towels. Diving and snorkeling: Ratio: 4 divers per guide or instructor. 12L aluminium tanks, 2 lbs weights, weight belts. 15L tanks and Nitrox 32% fillings available. Miscellaneous: Lots of comfortable seating, large sun deck, LCD-TV, DVD- and CD-Player in the saloon. Tree main meals and snacks are served as buffets and always include a vegetarian dish. Fresh fruits always available. 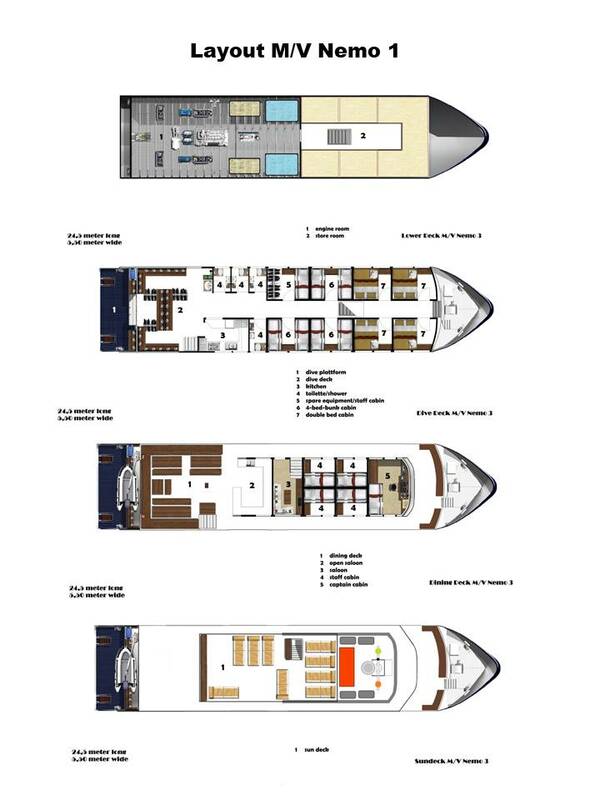 The boat has 4 double-bed and 3 quad-bunk cabins, which all have air-condition and sea-view windows. Communal areas on the boat include a large covered outdoor dining area, to relax between dives and where meals are served. There is also an air-conditioned saloon, where courses can be taught, and guests can chill out. The lounge has audio-video entertainment and sea-view windows. However, divers who come to Thailand and go diving at the best dive sites normally want to enjoy the views, sea breeze, sub-tropical weather and star-filled night skies. The diving platform is large and low, so that a comfortable and safe entrance/exit is possible. Of course, there is also a big sundeck on the top of the boat for sunbathing and enough mats are available. Nemo 1 does not stay in one place all the time. In fact, on most days, there are 4 different dive sites visited. Depending on the day of the week, Nemo 1 cruises around the northern half of the Similan Islands, Koh Bon or Koh Tachai. 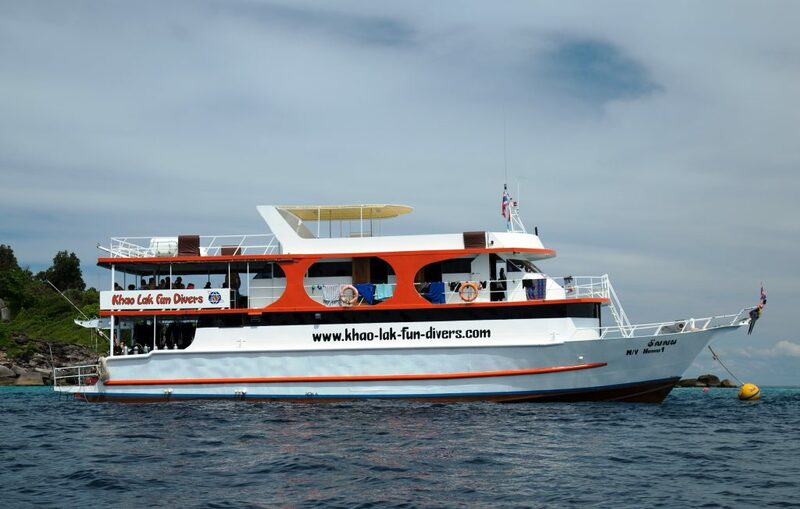 On Mondays the boat is at Koh Bon, often the best place in Thailand to see Manta Rays. Tuesdays is for Koh Tachai, again a popular spot for Manta Rays and sometimes something even bigger. The rest of the week is spent at the best dive sites of the Similans. There are meals served buffet-style throughout the day. These are mainly a mix of Western and local cuisine, but not too spicy. Soft drinks and beer are available at very reasonable rates, and there are always fruits, snacks, tea, coffee & drinking water available for free. Our speedboat Nemo 2 we operate as a feeder for our large dive boat. It was designed and built by us for divers. The Nemo 2 is a building block in our concept for speed, comfort and quality. The speed boat is also available during the day for our beginner diving courses and our non-divers. The boat is inspected and maintained annually by the builders boatyard. From the beginning, our goal has been to pamper our guests with maximum fun and relaxed holiday atmosphere, away from stress and mass processing.